Submit your email and we'll keep you up to date with all the latest news from Emmaus Bristol. We are delighted to announce that Chris (left in the picture), one of our Companions has received the Charlie Jordan award for Solidarity. This is an individual acheivement award given to a Companion who has made an outstanding contribution to Solidiarity (helping others beyond Emmaus). Amongst other things Chris has been involved with an emerging Emmaus group in Trowbridge and has participated in a number of solidarity events in Europe. The award comes with a grant for £500 towards travel to other Emmaus Communities in the world. 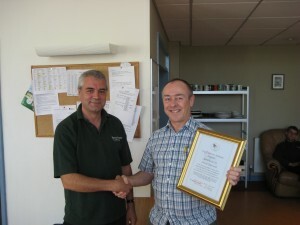 Chris being presented the certificate by Dave Perry (right) our Community Manager.